Usually ships in 26 to 29 days Estimated lead times do not include weekends or holidays. Transit time is determined by shipping method and destination. Orders requiring credit information might take additional time. 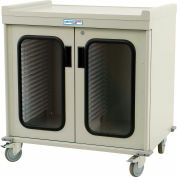 The MS8160-CARDIO is a triple column medical storage cart, with tambour door, designed for quick access to medical supplies, featuring the most innovative modular tray system on the market. The MS8160-CARDIO is preconfigured as follows: left column, top to bottom, 3 each 1/2" trays, 2 each 2" trays, 2 each 4" trays, 3 each 8" trays; middle column, top to bottom, 4 each 2" trays, 3 each 4" trays, 4 each 7" wired baskets; right column, top to bottom, 3 each 1/2" trays, 2 each 2" trays, 2 each 4" trays, 4 each 8" trays. The MS8160-CARDIO is a preconfigured triple column medical storage cart designed to supplies for cardiovascular surgery to treat complications of congenital heart disease, rheumatic heart disease and atherosclerosis. Offers 35% more tray or basket storage capacity when compared with leading competitor's product, using 2", 4" and 8" modular trays; or 4" and 7" wired baskets. 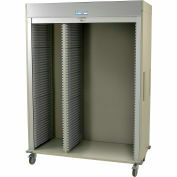 Increased storage capability means fewer carts need to be purchased, thereby reducing capital purchase cost. 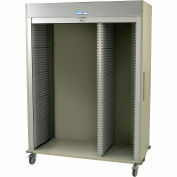 Further optimize space within trays with adjustable dividers that have a unique locking design, called the "clip-on effect," to withstand high loads. 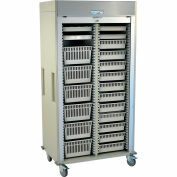 Unique design of plastic side panels, combined with pull-out-stoppers, allows modular trays to be extended and viewed at an angle without falling out of the cart. Catheter shelf can be added featuring three robust dual slide assemblies, each slide contains five hooks. 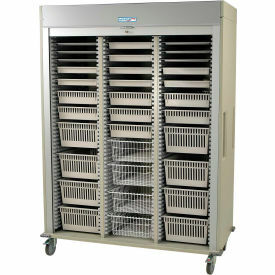 Plastic side panels form a modular system consisting of 141 insertion opportunities (47 per column) to hold modular exchange trays and baskets, which are sold separately. Catheter Shelf Holders can be added to any column. Or remove column to install full-width shelves on the left or right of the cabinet. 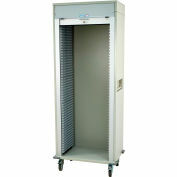 See product numbers MS8160SH-L or MS8160SH-R.
Roll-up tambour door with key lock allows access to supplies during clinical hours.